September 18, 2017 Baking, Pastry & Culinary Arts, Business & Hospitality, Business & Hospitality Management, General Information, Penn College Magazine, Penn College Magazine Feature Comments are disabled after 182 days. 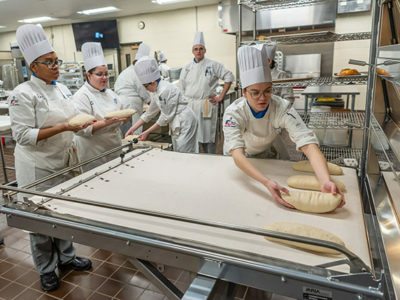 During preparation for the college’s first Visiting Chef dinner in 1992, students Ric Newton and Vanessa Buck study the technique of Visiting Chef Richard L. Kimble Jr.
From the Fall 2017 Penn College Magazine: The Visiting Chef Series was established to inspire students by working alongside the nation’s best chefs. A quarter-century and more than 50 chefs later, renowned culinarians continue to bring the vision to life. Read student memories and view a visual history of the series.